Generally speaking, every task is a balance between speed and accuracy. You can complete a task quickly at the potential cost of accuracy, or accurately at the potential cost of speed. This is one of the challenges researches studying quantum computing are facing. Harnessing quantum phenomenon to build quantum computers is tricky because tracking and controlling quantum systems in real-time is an extremely delicate task. Trying to manipulate such systems quickly can easily produce errors in the end result. 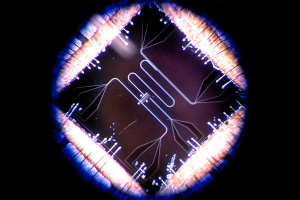 Now, a team of researchers from Aalto University has developed specialize circuitry for handling this task both quickly and carefully. The results of their work were published in the journal Science Advances. In order to achieve this quantum balancing act, the team used a custom-designed electrical circuit called a transmon. When such a circuit is chilled to within a few thousandths of a degree above absolute zero it begins to behave like an artificial atom and exhibits unusual quantum characteristics. One such characteristic means the transmon can only have certain values of energy. The researchers describe these “energy levels” like rungs on a ladder. You can only stand on one rung at a time and move either one up or one down. Now imagine you’re trying to carry a glass of water too. Suddenly the process is much more delicate, you would need to move slower to not spill the water. By firing two different microwave protons at the transmon simultaneously the researchers found they could make it jump more than one rung, without spilling water. In other words, the transmon exhibited a jump in energy levels previously thought impossible at a speed near the theoretical maximum. Ladders? Energy levels? We get it, there’s a lot going on here. Essentially, the ability to more precisely control high-speed energy transfers is a promising breakthrough. Not only could the finding have many uses in the development of quantum computing and quantum simulations there may be other technical applications as well. The speed of the energy transfer begs new questions, such as, are there fundamental limits to how fast we can charge the battery of an electric car? A future filled with rapidly charging devices sure would be nice. The new research means not only will the future be fast, it will be precise as well.